And she did just that. At age 18, Felix competed in her first Olympic Games in Athens, winning silver in the 200 meters. This year, the 30-year-old is back and stronger than ever, poised to race the 200- and 400-meter races in Rio de Janeiro. If she wins gold in both those events, she’ll be the first woman to do so since Marie-Jose Peric in 1996. Felix can feel pretty confident looking forward to Rio, seeing as how she won the 400 meters at the World Championships last year in Beijing. Then there are her many other accomplishments to consider: six national titles in the 200 meters, a four-time recipient of USA Track & Field’s Jesse Owens Award for Athlete of the Year, and — oh yeah — those six Olympic medals (four gold and two silver). It's an absolute joy to watch her compete, and I can't wait to see what she has in store for us at the Olympic Games this summer. In partnership with Jif®, here are a few of my favorite moments from her career so far. Upon her high school graduation in 2003, Allyson forwent NCAA eligibility and went straight to the pros. Just one year later, she qualified in the 200 meters for the Olympic Games in Athens in 2004. There, she finished second overall in the finals with a time of 22.18 — a World Junior record that she still holds today. 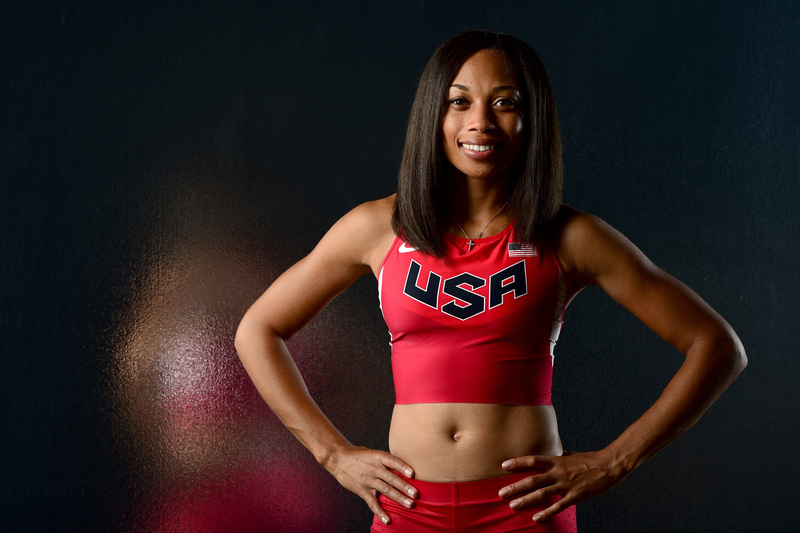 Just five years after trying out for the track team as a high school freshman, Allyson was officially on the world stage. Felix's first individual Olympic gold medal came in 2012 in London, where she won the 200 meters in 21.88 seconds. Jamaican sprinter Veronica Campbell-Brown had won the 200 the past two Olympic Games, but Felix, who was top-ranked going into the event, finally dethroned her. Earlier that year, Felix spoke of her love for the 200-meter event, alluding to the curve and straightaway of the track: "The 200 is my baby … I love the 'being whipped-off' feeling — that slingshot when you do it right." 2015 was an impressive year for Felix, which bodes well for these upcoming Olympics. She won her first gold medal at the World Championships in the 400 meters, with a personal best time of 49.26. Not only that, but in doing so, she became the first woman ever to win gold at Worlds for the 200 meters and 400 meters. She also became the top earner of gold medals of any American. She chose to focus on the 400 meters at the 2015 World Championships because the 200 meters was slated to take place just one hour prior, and she wouldn’t have been able to compete strongly in both. So for the 2016 Olympic Games, she and her team have worked with the organizing body to make sure events are scheduled so she can fully compete (and hopefully take gold!) in both. She's very close to her family as well. In fact, in case you were wondering where she keeps them, the gold medals are at her parent's house. Meanwhile, her brother Wes, a former sprinter himself, acts as her manager. Allyson has said that her family puts happiness, health, and faith above all else — and her illustrious track and field career is just icing on the proverbial cake.